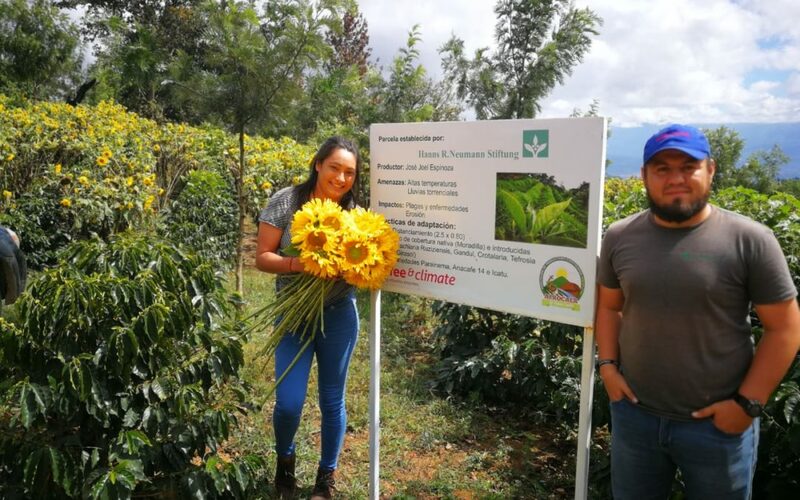 coffee&climate agronomist Karina Orellana is holding a bouquet of sunflowers in her hand. Together with her colleague Previn Valdivieso she is visiting Joel Espinoza. Joel is a coffee farmer from Copán, Honduras. “I haven’t been part of a farmer organization and rarely attended to trainings, just like the majority of coffee farmers in the region”, Joel tells. By the beginning of 2016, Joel participated in trainings to improve organizational development and agronomical management as part of the Trinational Program for Specialty Coffee from Hanns R. Neumann Stiftung in Trifinio. 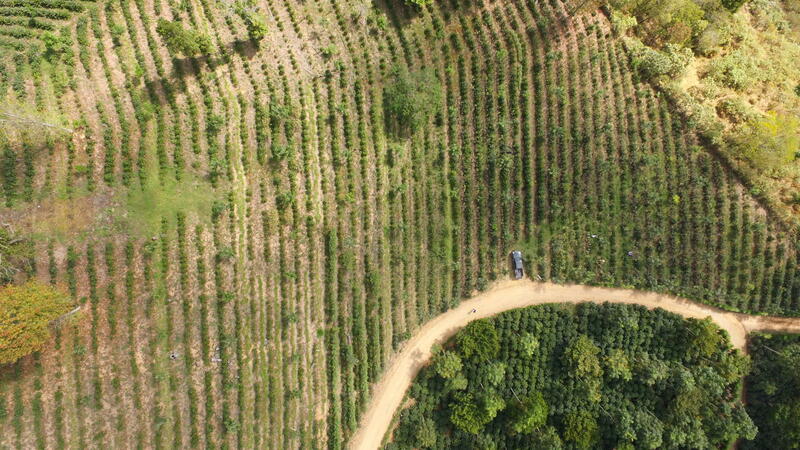 Through his eyes, Joel never saw climate change affecting coffee production in Copán. 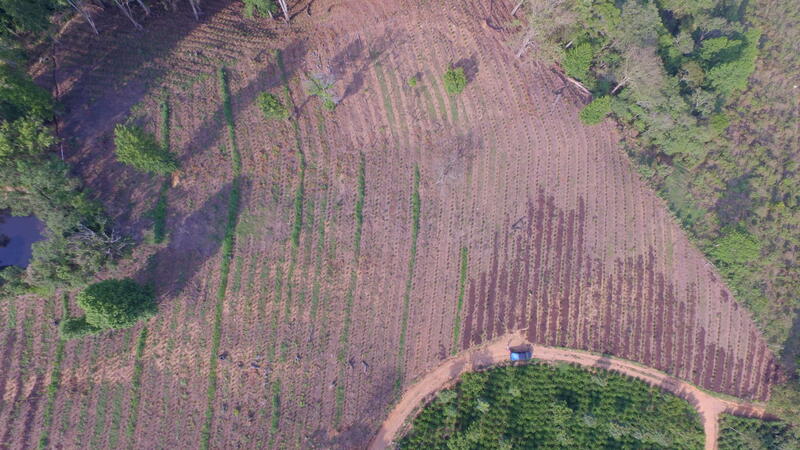 “It was just a few years ago, when I started to notice how the coffee rust and severe droughts started to affect and damage our production and the whole area”, he remembers. 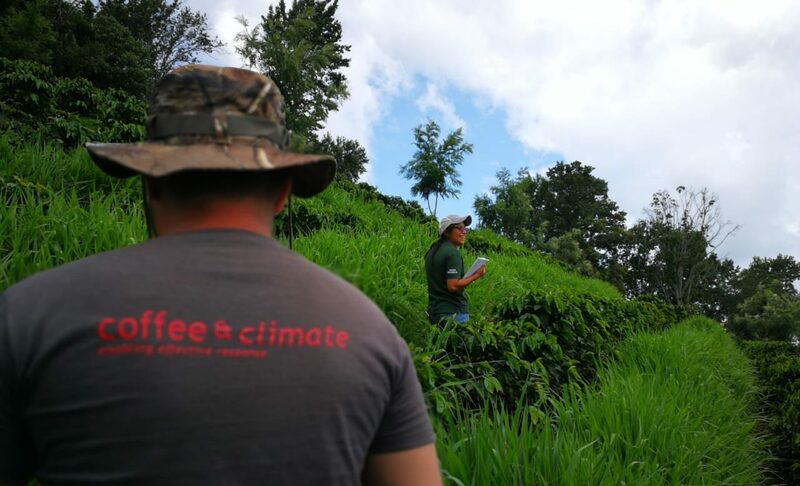 This motivated him to search for new alternatives, getting to know the climate-smart agricultural practices (CSA) of the initiative of coffee&climate promoted during one of his outings to a demoplot established by c&c. By then he knew that they need to incorporate adaptation practices and decided to establish new coffee plantations with resistant varieties in 2017. “Some of the things we did was change the distance between coffee planting and introduced new cover crops on our farm”, Joel tells. The distance for planting is usually 2 meters between rows and 1 meter between plants. Joel modified both to 2.5 meters x 0.8 meters each. Findings from Franco Coaracy in 1982 proove that coffee tree roots are highly affected by soil temperatures above 33°C, causing feeder roots to be killed and plant growth to decrease. In Central America, high temperatures are usually experienced from February to April or during periods of time when it stops raining during the rainy season. 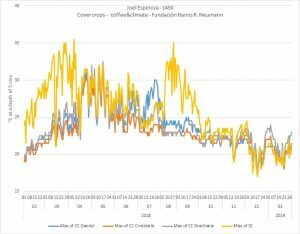 Today, Joel assures farmers on how important cover crops are, explaining that climate is changing and coffee production will continue to be impacted if correct CSA practices such are cover crops are not implemented. 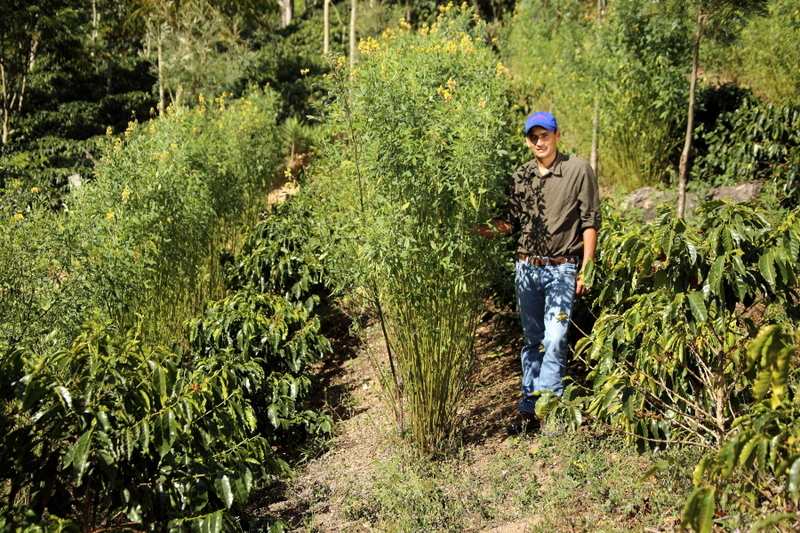 Find out more about the role of cover crops and other CSA-Practices in the coffee&climate toolbox.